Imagine for a moment that your puppy, raised as part of your family, is snatched from you and sold into the dog meat trade? Take a deep breath… and prepare yourself for a family movie which “opens the can” on today’s international lion crisis. Its central theme shows lion cubs, treated as house-hold pets, then shot for stuffed trophies on walls… Today, this notorious industry is known as the “Canned Lion” Hunting industry. 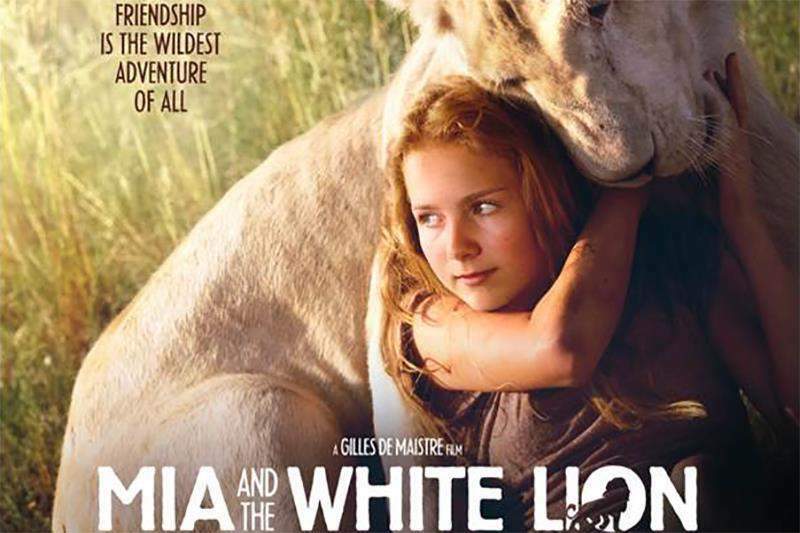 Set in one of these “Canned Hunting” operations, MIA and the White Lion follows the story of a girl who discovers to her horror that her father is offering her own hand-reared lion to be killed. What a terrible betrayal, not only between father and daughter, but human and lion. The Global White Lion Protection Trust, the Non-Profit Organisation which I founded in 2002, has fought tirelessly since then to raise awareness of this brutal trade. Once revered as the “King of Animals”, lions today have become “Canned” commodities: mercilessly exploited in a lucrative production-line which first presents tiny cubs to tourists to pet for a price; then offers these same tamed lions as adults to trophy hunters for blood sport. To make this cuddle-to-kill industry more lucrative, some of the tamed lions are treated as living skeletons, starved before being butchered so that their bones can be sold into eastern markets for bogus medicinal purposes. As many as 800 lions per annum leave South Africa as skeletons – that’s the official quota, which doubled to 1500 this year. A horrific contemporary setting for a family film. The Hellish place that held my White Lion cub captive was called “Bethlehem” (as in the movie), and the movie’s reference to Christmas Day is a biographic reference to the cub’s actual birth there on Christmas Day, 2000. [See my book, Mystery of the White Lions, 2001*] Ironically, Bethlehem, South Africa, housed one of the first lion killing operations. Fast forward to 2019. Instead of shutting down the industry – as promised by the South African government when it was first made public, cub-handling is now available as a tourist activity. In Mia and the White Lion, it’s believable that 11-year old Mia unwittingly helps hand-rear her White Lion cub, Charlie, only to discover that he is destined to be sold for slaughter by her greed-driven father. Small wonder Mia tries to escape and travel across the country to get Charlie to freedom in the sacred lands of Timbavati. It’s also understandable that neither she, nor the audience, anticipates that despite her efforts, Charlie is still not safe. As a lion conservationist with a track-record of over 3 decades, I can vouch for the fact that a White Lion like Charlie has a price on his head – a prized trophy with high risk of being shot after release into the wilds of Timbavati! The movie’s vision is Charlie safely welcomed in Timbavati by a Shangaan Lion Priest. In reality, despite my work with the Shangaan elders who believe the White Lions are holy animals, they have no protection here. The real message here is that this entire trade is legal: slaughtering hand-reared White Lions in captivity, and or trophy hunting them as the last wild White Lions in their natural ecosystem. What can the movie, and what can the public, do to help? The husband-and-wife team of director Jilles de Maistre and screenwriter Prune de Maistre have expressed their commitment to blowing the lid on the Canned Lion industry. If they achieve this, we will be one step closer to banning it. With its many scenes of direct contact with lions, and Kevin Richardson’s background of handling lions for profit, Mia and the White Lion walks a fine line if it is to ensure that it isn’t promoting the very industry it wishes to prohibit. In the course of its production, I personally cautioned the producers about this risk. There is a danger that if the publicity is not correctly handled, the outcome could be many more cub-petting operations, set up to service a plethora of wannabe “Mias” pouring in from every corner of the globe, wanting the feel-good factor of cuddling adorable cubs. Much as we might adore cuddling a lion cub – as Daniah De Villiers (the actress who plays MIA) does on screen – the movie has to convey that this is not only undesirable, but dangerous. I’m not convinced that it achieves this. And What about Charlie the White Lion Cub? Kevin Richardson, who trained “Charlie” in Mia and the White Lion, is a high-profile animal wrangler who trains lions, from babyhood, to perform in movies. Sadly, it is well known that, even in Hollywood, wrangled animals often experience brutal cruelty during and after their service to the movie industry. For example, the movie White Lion utilised as many as 60 lion “actors,” most of whom were later sold or traded into the canned killing industry**. Knowing that abominable background story, it is critical to ask: what will become of the White Lion who plays “Charlie”, and other animal actors, in Mia and the White Lion? We’ve mentioned the risks to lions, however, there are also risks to humans. Keeping a full-grown apex predator in confinement and demanding that it behave unnaturally, because we “love” it, is asking for trouble. Tragically, but not surprisingly, disaster struck when one of Richardson’s tamed golden lions ran off and killed someone on his facility at the movie’s conclusion, in March 2018. The victim was a 22-year old woman who was simply visiting. It is critical that the Mia and the White Lion’s publicity does not sweep this death under the “Red Carpet”. Rather, it should be widely publicised, as this human fatality deepens the tragic message, about exploiting endangered wild animals, that we should be hearing. Despite these concerns, we’d like to believe that the heart of this movie is in the right place. If it is true to its objectives, Mia and the White Lion can help raise awareness, and increase the pressure on the South African government to follow through on its promise to prohibit this abomination. However, for the movie to achieve its objectives, it must help shut down not only the Canned Lion camps but also the cub-petting operations, since the two are inextricably linked. That’s where we – the general public – can be effective: stop the blood-shed, and turn the tide. Thank you, Linda, for your words of guidance and wisdom and for bringing us truth for not only the sacred White Lions, but so many other sacred animals. The words you shared have inspired me to to accelerate my personal support as well as global support for the protection of all these Sacred Beings. All life matters. The Lion that plays Charlie is named Thor, and he lives in the Kevin Richardson refuge.